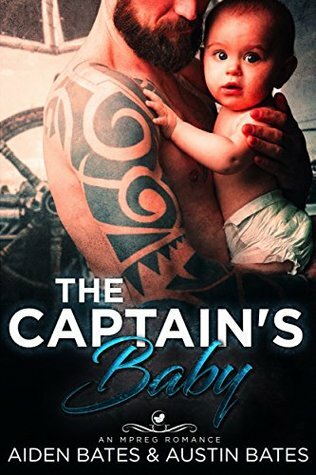 The Captain’s Baby Review ~ An exciting read … 8 out of 10! Cover Art: A tattooed bearded man holding a baby and a white wolf grace the book’s cover. The phrase “The Captain’s” is white and capitalized and “Baby” is in a script font and blue. They are set against a ship background. Will and Logan are opposites. Logan is the captain of a crabbing ship and Will is a scientist who studies orcas. The one thing that they have in common is the fact they are wolf shifters. The two men have a lot of passion for one another and it shows throughout the book. Secondary Characters: There are a couple of minor characters. Some are Logan’s friends, and some are William’s family and friends. They help the story along. Plot: It is an interesting story with paranormal elements because the men are shifters and they can get pregnant. This story has adventure and excitement. Conflict/Climax: This story has a lot of conflict, some of the problems that affect the characters are caused by mother nature and some are caused by other shifters. I think that the authors spread the tension around in a way that made you feel it. The authors did a decent job at making the conflict realistic. The climax comes in the form of a baby. Writing style: It was told in third person. Flow/Continuity: I think that this story did not have any problems with either flow or continuity. You could not tell that it was written by more than one author. The story is a good mix of romantic scenes and conflict. The characters felt like they belonged in the story. Conclusion: This is a story written by two brothers/authors. It has strong characters and well written scenes. I think that this was a well-crafted book because nothing seemed out of place in the story. The research about the orcas was there. It was an exciting read and because of that I would give the story 8 out of 10 stars. Previous A Shining Knight Review ~ Does not disappoint … 9 out of 10! Next Christmas with his Omega Review ~ Beautiful Christmas story about true love and soulmates … 9 out of 10!